"I'm an oil man!" Asserts Daniel Plainview (Daniel Day-Lewis) to a colony of naïve citizens of which he is astutely slipping into his trouser pocket one by one. However (in this case) the man speaks no lie for his veins do indeed run rich with plutonium oil. A crude, black substance embedded deep in the merciless heart of director Paul Thomas Anderson's gargantuan North American epic- There Will Be Blood. A perpetually steady, emotionally-draining and dark character study of an oil guzzling tycoon that vigorously chews on the themes of gluttony and deception, faith and ambition, death and revulsion. Do not be mislead by its title, though. This is not some balls-to-the-wall slasher-flick (as the "chavs" sat behind me seemed to think at the outset). It is a gruelling, drawn-out dissection of a loathsome yet sinisterly-comical individual consumed and maddened by his own persona. And it's absolutely formidable- visual and melodramatic arrestment at its bona fide best that exudes cinematic precision and awe with satire to spare. But it's also a long-winded affair. So thrill seeking, gore-craving moviegoers walk away, now. I'm afraid there will be no blood for you. Sorry. Add to that list- chic-flick, rom-com and sci-fi enthusiasts. You guys may be better off buying another ticket. Taking another ride. Those left, steady yourself for, perhaps, this year's most thought-provoking feature driven by a leading character performance fit to rival the very best.Ushering in a near dialogue-free opening 15 minutes with a distinct fade-in, Anderson wastes no time in introducing us to the protagonist. 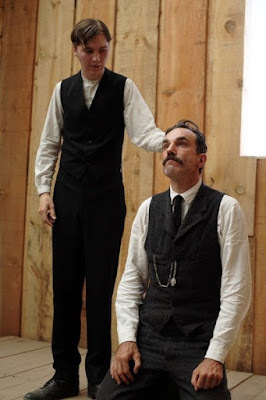 Daniel Day-Lewis plays…no scratch that…Daniel Day-Lewis is Daniel Plainview. An ambitious, moustached miner who, while thrashing away at the crust of his motherland- at the turn of the twentieth century- strikes oil. A profitable discovery that fortuitously leads him to H.W (Dillon Freasier), a new-born infant of whom he slots forcefully under his oil sodden wing only to drag about the entire continent in search of large segments of land in which crude oil is stirring directly beneath. Soon enough, Plainview forges a blossoming "family" oil drilling corporation that soon establishes itself as a force in the industry and prospects appear even brighter when, in 1911, Plainview receives a generously eerie, yet pricey tip-off as to where there may be a sturdy supply of his beloved oil. A tip-off in which he pursues like a unwavering moth to an oil fuelled flame as he meanders ominously into Little Boston, California where the true colours of the indomitable oil baron edge disturbingly into light.Daniel Plainview is an angry, vengeful man whose promises and loyalties to those around him are as false and as futile as his love and respect for God. He "guarantees" the people of the Little Boston ranch; food, water, schools and, to the town's radically odd preacher Eli Sunday (an inspired Paul Dano), a newly renovated church of the Third Revelation. But he cares little for the reserving of his pledges and spends little time guilt-tripping over his numerous acts of iniquity. "I look at people," he says "and I see nothing worth liking." "I have a competition in me," he continues "and I want no one else to succeed". Self-centred sociopath?…Yep, for Plainview is as putrid and as predatory as any character to ever grace the big screen. He putrefies slowly, though. The end product appearing more entity than man. Better yet: an egocentric emblem of evil that governs the screen in an implausible manner in which only an actor of Day-Lewis' calibre can. The sheer potency of his flawless portrayal actually carries the relatively toothless narrative in areas which could be further criticised for chugging along at a near crawling pace at times.Visually and acoustically, though, TWBB is outstanding- every nuance of every aural and cinematic component work so well with one another to help give the film such power and impact. It's just a shame that no real direction or purpose bled into the screenplay for which Anderson adapted from Upton Sinclair's 1927 novel- Oil. As far as storytelling goes, Anderson has underperformed here. His narrative lacks any legitimate path or hooks and, to be honest, the lack of defining moments- bar the infamous confession and milkshake scenes- within 158 minute running length is a little disappointing. But the manner in which Day-Lewis dictates the audiences' attention more or less vanquishes any negative thoughts regarding the muscle of the plot. Which is why it comes as no surprise that everybody and their brother have duly commended the London-born method actor's impeccable, Oscar winning performance: the epitome of everything grand about Anderson's fifth but not quite finest feature yet; profound, provoking, intense, immense.In spite of its flaws, TWBB is still an exceptionally powerful piece of cinema that'll remain etched in the minds of those who take to it for quite some time. Even if it's quality is not there for all to see, in plain view.